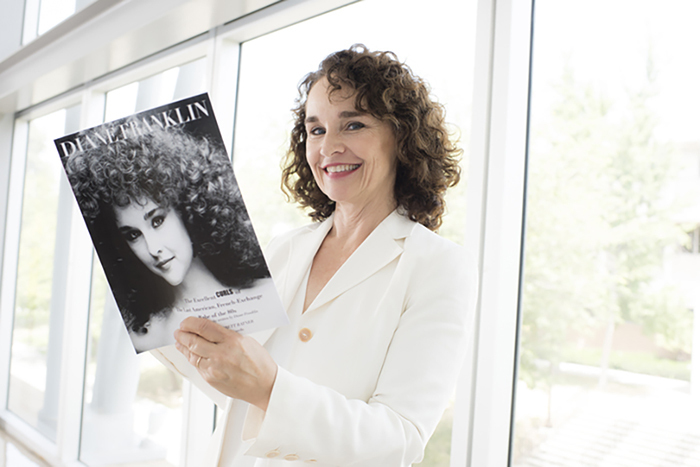 Diane Franklin poses with the book she was inspired to write at CSUN. Photo by Lee Choo. Franklin plays the role of French foreign exchange student Monique in 80s comedy film "Better off Dead". Photo provided by Diane Franklin. Franklin proudly poses with her CSUN degree. Photo provided by Diane Franklin. Diane Franklin ’16 (English) often compares her life to the story of the tortoise and the hare. First, she was the hare. After a modeling career that begin at the age of 10, Franklin moved on to acting, where by the end of her 20s, she played main roles in The Last American Virgin, Better off Dead, Amityville II: The Possession and Bill & Ted’s Excellent Adventure. Then, in her 40s, she was the tortoise. She attended Moorpark College off and on. She had stalled on writing her autobiography, and motherhood had largely replaced her acting career. But after transferring to California State University, Northridge, Franklin found an inspiring new career for the next chapter of her life — and the direction she needed to keep running. Franklin never gave up on her dream of earning a bachelor’s degree, despite some bumps in the road. After earning enough money through modeling and doing commercials, Franklin enrolled at New York University in 1981 at the age of 18. However, she dropped out a year later after earning a lead role in The Last American Virgin, a decision some of her friends thought was a mistake. 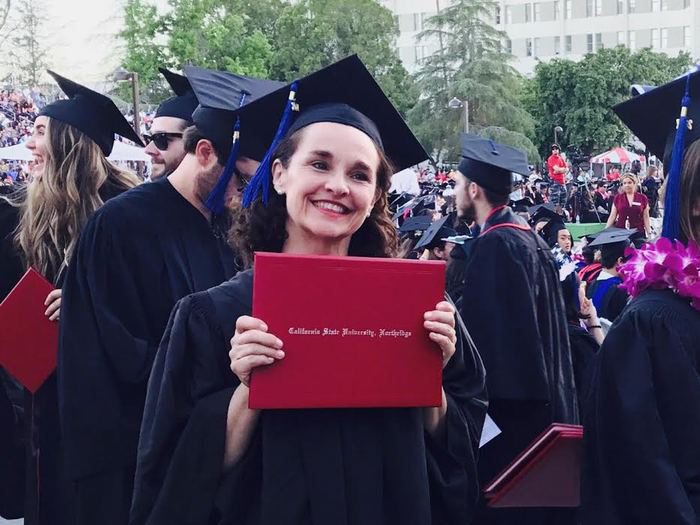 Franklin’s decision to come to CSUN at a later stage in life wasn’t just a humbling experience, but the only path she felt her career allowed her to take, she said. “Some careers like dancing, sports and acting are typically careers [for the young], and when [opportunity] knocks, you have to answer it. Opportunities like [movie roles] won’t wait for you to get your degree,” Franklin said. But that initial uneasiness quickly turned into an enriching experience that allowed her to connect with her peers and develop the writing skills needed to complete two autobiographies — a feat she never thought she’d accomplish until she came to CSUN. On a personal level, Franklin was able to connect with adults her age and give advice to those who needed it. This desire is one of the many reasons Franklin has her heart set on teaching the next generation of adults. Currently earning her drama teaching credentials, Franklin is teaching students in the Rio School District drama in Oxnard. 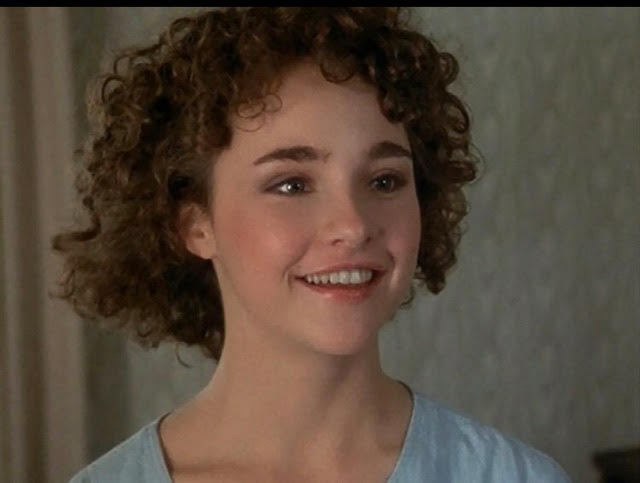 Franklin autobiographies, Diane Franklin: The Excellent Adventures of the Last American, French-Exchange Babe of the 80s and Diane Franklin: The Excellent Curls of the Last American, French-Exchange Babe of the 80s can be found on Amazon.